I can’t remember a promised debut that generated more excitement among our little community than ICE CREAM SUICIDE’s. Hell, I was practically beside myself at the thought — between the name and the art and the sophisticated introductory campaign of three groups by a newcomer agency and the inclusion of former Bellheart member Anna-chan, it all seemed like the idol world had heard our pleas and put together a special little project just for us. And then they had their live debut, and BOY were a lot of people confused. Instead of a -core-riddled harsh idol project speckled with yami-kawaii violence, we got what sounded like a safe, contemporary-standard denpa-style pop song. I remember the Twitter chatter that day: Had we been had? Like, of course denpa makes sense because it’s so hot right now, but where’s the rock? Sanity did ultimately prevail and people seemed to reach a consensus agreement to withhold actual judgment until the debut EP, I.S.C.R.E.A.M., was released. So what does I.S.C.R.E.A.M. sound like? What does ICE CREAM SUICIDE bring to the world? On to the review! Also, you guys are jerks because nobody laughs as hard at that pun in the title as I do. It deserves a trophy for being so clever. I’ll preface the actual review with an important note: For a five-track EP, I.S.C.R.E.A.M. is genuinely kind of schizophrenic. Denpa song is, in fact, its dominant feature, but don’t let that fool you — there are some very solid rock points in here. Really, if there’s a consistent theme, it’s one of A-pop-derived mania that, stripping away the intensely blinking lights of the type, roughly overlays a little bit of familiar (to us, at least) idol pop and a little bit of familiar idol rock. That denpa madness, though. “Tengai Renren Alpinism” is, I believe, the song we all dropped our jaws to during the live debut, and I’ll stick out my neck by calling it probably the safest, most standard-issue song on the record. Weird, right? But that’s the thing — it’s great for a debut because it hits all the right tropes of contemporary idol without veering too hard toward anything that might turn off an audience. Better is “Joy Dash,” which goes much harder in that denpa direction (denparection? 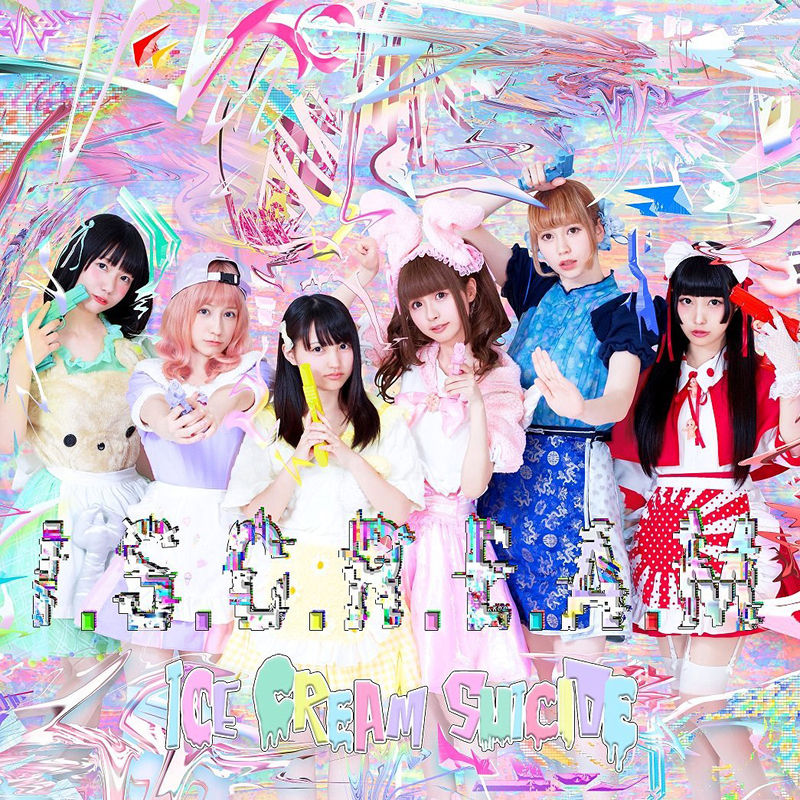 ), flat-out pulling moves that I recognize from Dempagumi.inc’s World Wide Dempa (which is a great album if you’re interested in the form, honestly). It has the off-pitch vocals, frenetic pace, rapid-fire key changes and manic instrumentation that denpa fans crave like plants crave Brawndo. I personally like this song quite a bit, but I can get why many of you wouldn’t (only the very coolest among us enjoy denpa song, after all). On the more rock-oriented front, the lead track, “VOiCE,” carries some of the same energy as the poppier numbers, but it’s honestly a nice idorock kind of song that honestly might sound familiar if you’ve been drinking the waters of the likes of Babyraids Japan or CANDY GO!GO!. More everybody here’s cup of tea is probably “Delusion Literacy.” In addition to having a tremendous damn title, it brings a bit of a heavier edge to its idorock core, with a neat guitar riff that’s actually more brain-addictive than the deliberately catchy other stuff, and it keeps teasing what could be an enjoyable breakdown that never quite manifests (like they wanted to have some heaviness without having to commit to it). Tying things together as well as can probably be done is “More Revolution,” which works a lot of rock elements into what would otherwise be comfortable A-pop, not dissimilar to the half of Zenbu Kimi no Sei Da’s catalog that a lot of people pretend doesn’t exist. It’s a good way to close out a first recording for sure, as it shows off what you’re about all at once and sort of forms that summary paragraph at the end of an expository essay. Musically, while it’s stylistically kind of uneven, I’d give it a general B+ kind of note for songwriting; not particularly inspired, and we’ve heard pretty much all of this before one way or another, but it’s of high enough quality to count. The vocals are tough to measure, given that denpa deliberately pitches off key, but whoever’s singing lead on some of these songs is doing a really good job, and the all-together choruses are blended fairly well together. For idols, getting that last stuff right can be the real challenge, and it’s met. This is one of those times when I’m going to fall back hard on the review scale for help. Just from a quality perspective, I’d be comfortable giving anywhere from three to four Heartbleeds, depending on my mood — the music sounds nice for the most part, though, if you’re not so much into denpa song, you might find some of the elements (the synth that appears out of nowhere on “Delusion Literacy,” for instance, and almost replaces the bass line) really clever and inventive, and you wouldn’t be wrong because that’s literally the style. I just wish a few more chances were taken, the mold at least cracked a little without breaking. So then, considering that this is sort of ultimately a website about idols and various flavors of rock music, where does that part of the album stand? Somewhere around petit pas!, I’d say. Both “VOiCE” and “Delusion Literacy” evoke the better parts of idorock in general, the latter flirting with brutality in a way that makes you wish it would just up and accept some genuine heaviness. Putting all of that together, I see a debut record that, somewhat schizoid identity aside, pleases in general. For this crew, too, it certainly wins more than it loses (I know there are enough Zenbukimi fans out there who’d probably dig it). On the flipside, no, I wouldn’t consider it a must-own just because we’ve been here before, for the most part. You could probably feel comfortable buying it just to see what ICE CREAM SUICIDE is all about, but no, it isn’t a must-own. None, because they don’t have any videos! I’d probably add “Delusion Literacy,” though. I’m not really surprised about your description of ICE CREAM SUICIDE’s sound in this review. I kinda expected it would be something like that. I still want to check them out. I’m still hoping that DEVIL GUN won’t disappoint in the heaviness department though. From the few people who have heard, it’s significantly rockier. I am still waiting for my copy to arrive, but I am sure I will enjoy it. I have enjoyed what I have seen and heard so far. On a side note I am also awaiting something from DEVIL GUN. I am more interested in them. Botan told me (also confirmed by Kaai) about their sound before they were told not to speak with fans anymore. Heavier rock sound with some growling vocals. I was hoping something would emerge from their first two performances.